Today marks the beginning of the next phase of our lives. 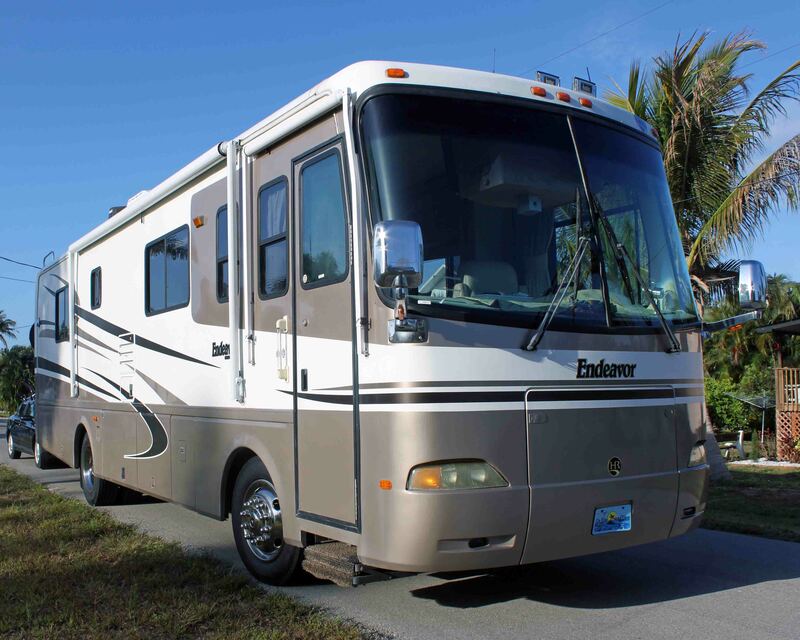 Today we sold our beautiful home on a saltwater canal in Saint James City Florida and embarked on an open ended journey in our motorhome. Our rolling one bedroom apartment will provide the comfort and security of our own kitchen, bedroom and living space while delivering us to historic locations, spectacular scenery, wildlife, trains, and friends we haven’t met yet! We’ve promised each other that it will be one year to start. Then we’ll look at each other again and decide to keep going or look for a permanent location – another house. We’ve got some pretty big ideas. But the journey will start slow. We’ll stay in Saint James City at the KOA for a few nights so we can tidy up the paperwork and help friends with their move. Then we’ll get some maintenance and minor repairs done in central Florida. By the end of our first week we’ll be visiting our daughter and her family in Fleming Island Florida. From there we’ll head West where our plans include Durango, more family in Seattle, Alaska, British Columbia, Oregon, California, Hawaii and Baja California. Friends are always welcome to join us along the way and we hope our paths cross with many. Come on guys, I know the truth,, You two saw a major crime and are going into witness protection.When you get set, send me your new name and address, I promise not to tell anyone. Well I might just tell one person if the reward is creditable. Anyway, May God bless your journey. Looking forward to riding along with you. 🙂 Safe journey. See you soon. Happy Trails! We wil miss you on Pine Island. May the journey be all you hope for. Safe travels. David and Marcia. Sorry we weren’t home yesterday to see you off. Hope you have a wonderful time. I will miss you both! sigh – I’d like to be a fly on your wall. But I don’t have much enthusiasm for trips without Cork. DO have many happy memories (and photos.) You two will be in my prayers for safety, great joy, and faithful vehicle. YOU WILL BOTH BE MISSED AND I’M SORRY I DIDN’T GET TO SEE YOU BEFORE YOU LEFT. I DIDN’T THINK I SHOULD INVADE THE ORANGE TENT. HAPPY TRAILS, STAY SAFE AND HAVE FUN. I so admire you two having the ideal retirement (and love your sense of adventure) but am a little worried about you driving to Hawaii! 😉 I see how you gravitate back to Durango too (I love the West). I’ll be flying to Pensacola, then Andrew and I are going to Northern England to visit British friends from more than 40 years ago (they’re getting married). Anyway, have a blast! Always look forward to “What the hell are the Kings doing now?? ?” Excited for you guys as it looks like an unbelievable itinerary. Sooner or later you’ll have to find yourselves enjoying the beautiful sites on the East Coast. That way we can camp together again. Been too long!! Enjoy the next phase. We hope to visit your neck of the woods in the not too distant. It would be great to camp together again. Thanks for the comment. We are very excited about our plans!! Let the adventures and blog posts begin – do enjoy hearing about your travels. Hope your trek North was smooth. Keep us posted on your Summer plans. We would love to cross paths. I am so happy that your long awaited journey has begun! I wish you all happy memories, safe travels and stories for the rest of us following you! I will miss your smiling faces! Hugs!